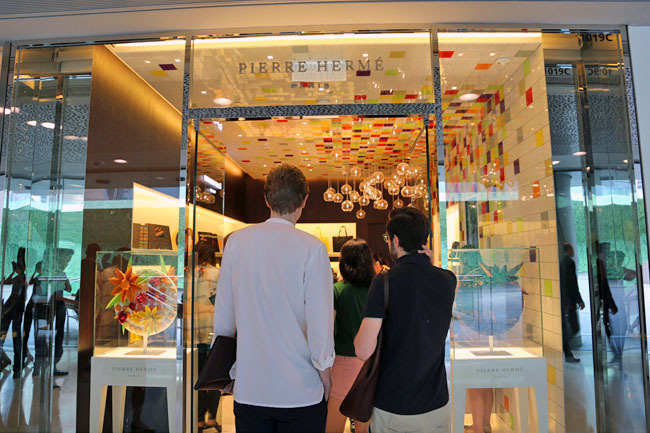 [Hong Kong] Pierre Hermé has opened in Hong Kong, and I won’t be surprised if people would be tempted to fly over to get their hands on a box of “The Picasso of Pastries”. I suspect that many Hong Kongers have sweet tooths, seeing the number of chocolate, dessert and macaron shops that are sprouting in the city. Ladurée has already created quite a queue at Harbour City, and it is no doubt that macaron masters Pierre Hermé will enjoy huge popularity at ifc. Both my friend and I were not macaron persons, so we nosed around the shop wondering if we could just get one to try “Can just buy one or not ah?” We ended with the minimum order of 7 in a “Paris Landmark” box for HKD$210 (SGD$34.27). Comparatively, the flavours are really quite exciting: Arabesque (Apricot & Crunchy Pistachio), Crème Brulee (Vanilla & Caramel Pieces), Imagine (Matcha Green Tea & Black Sesame Crisp), Infiniment Chocolat Porcelana (Pure Origin Venezuala Porcelana Dark Chocolate), Infiniment Rose (Rose & Rose Petals), Céleste (Passion fruit, Rhubarb & Strawberries) and Mogador (Milk Chocolate & Passion Fruit). No wonder most of the office executive are getting the “Tout e monde en parle” box of 24 at HKD$660 (SGD$107.70) to try the different combinations. They just buy them by the boxes as though they are free. 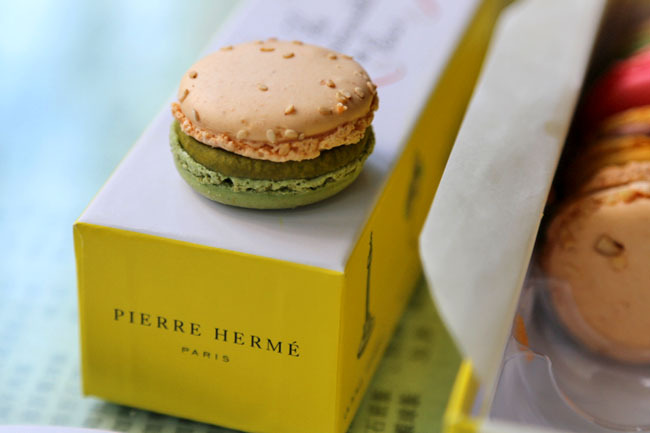 The million dollar question is: Is Pierre Hermé better than Ladurée? The short answer to that is: Yes. On first bite, I felt that I preferred Ladurée’s crust, which is lighter and crisp while Pierre Hermé’s meringue disc was chewier and thicker, and even sweeter. But…if you just allow the macaron flavours to linger in your mouth, the explosion of sensations of Pierre Herme’s creamier ganache layer makes is all very thrilling to relish. Talk about creativity. My favourite macaron was a Japanese-inspired Imagine with combinations of Matcha Green Tea and Black Sesame Crisp, the balanced interplay of both tastes makes eating a macaron memorable and fun at the same time. 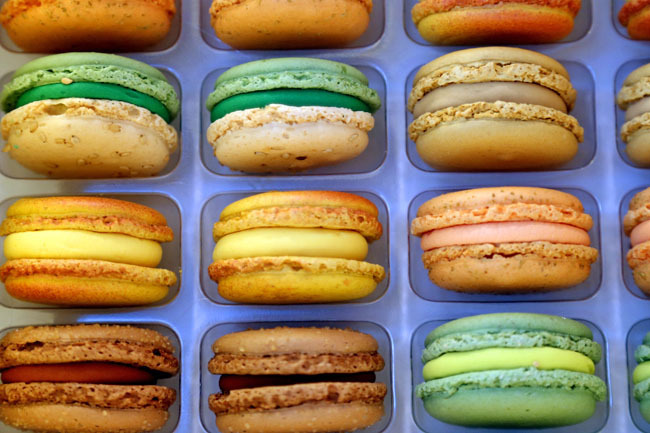 So fans of macarons, is it Pierre Hermé or Ladurée for you? I haven’t tasted any of them either. But all of my friends here in Manila are raving about Laduree. If it’s better than Laduree, it will surely become a heaven of happy sweetness. Have a great week Daniel! 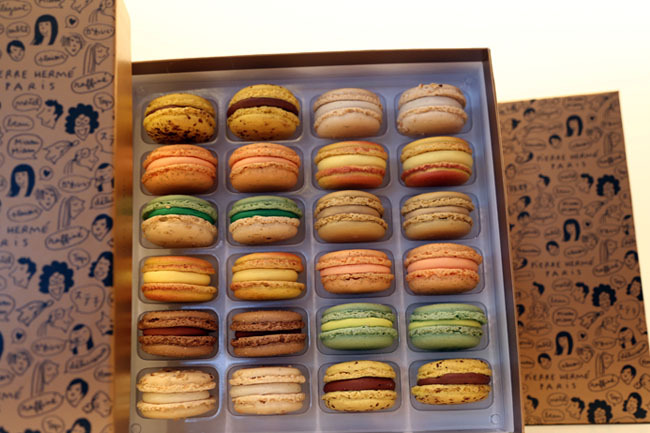 My older sister went to France and tried alot of maccarons there – But 2 stood out for her: Laduree & Pierre Hermes. In terms of texture she like Laduree but Pierre Hermes was really special coz they seem to focus more on taste – unusual pairings of flavours that just seem to go together really well. 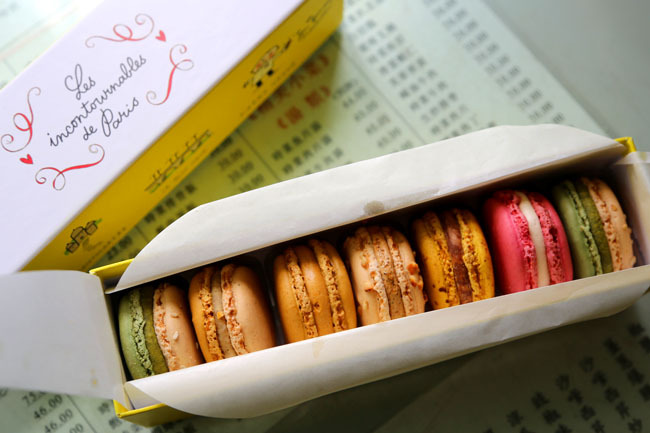 Will really love to try Pierre Hermes macarrons one day!